Fidele Mpiranya received the Ph.D. in Linguistics from the Université Lyon 3 in 1996. He has been a Lecturer in Swahili and African Linguistics at the University of Chicago from 2006 to the present, following a Fulbright grant from 2004-2005 (hosted by USC, Los Angeles). 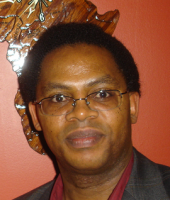 Prior to this, he held positions as a research adjunct at Université Lyon 3 (1996-2003) and Paris 3 - Sorbonne Nouvelle (2003-2006) and as an Assistant Professor at the University of Rwanda (1987-1991). He is the author of Swahili Grammar and Workbook, London/New York: Routledge 2014; "An articulatory view of Kinyarwanda's sibilant harmony", in Phonology, vol. 25, pp.499-535 (with Rachel Walker and Dani Byrd), and Swahili phonology reconsidered in a diachronical perspective, Köln: Rüdiger Köppe, 1995.